Our cat has some type of skin problem or infection. 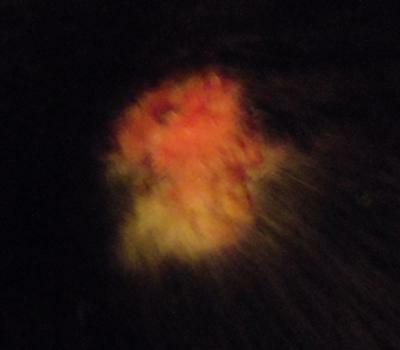 He had it about 2 months ago, the vet tested him for ringworm & the test came back positive. After 4-5 weeks of taking medicine he was re-tested & the test came back negative. The cat has this moist, red, oozing spot on his neck again. I have blotted it with a moist paper towel & it is pink from blood. 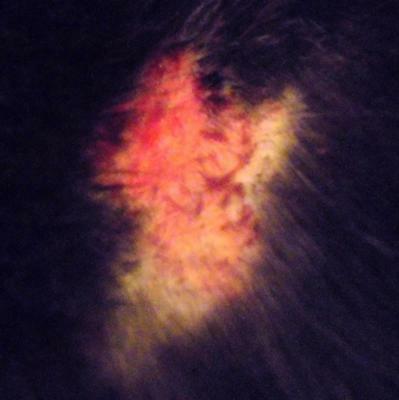 The spots start as scab like spots, clumps of hair come off with the scabs, and then the spots become red, moist & oozing. What could this be & how can we get rid of it? It’s hard to say what your cat’s skin lesion is based on the photo and description, but the first thing you should do is get him back in to your veterinarian for another ringworm test. It can be difficult to determine when a ringworm infection is completely eliminated, so I’m concerned that treatment may have been stopped too soon and he has relapsed. Since ringworm is contagious to other animals as well as people, you certainly don’t want to ignore that possibility. If you have other cats in your home, you might also want to have them screened to make sure that they are not asymptomatic carriers that could be the source of reinfection. If your veterinarian determines that ringworm is not to blame, he or she can also perform skin scrapings to look for mites, skin cytology to rule out infection, and run any other diagnostic tests (e.g., a biopsy) that might be necessary to come to a definitive diagnosis and effective treatment plan. Join in and write your own page! It's easy to do. How? Simply click here to return to Cat Skin.